Glissando Harps features Camac and Salvi 47-string concert harps sampled in full detail. Each Harp was sampled in a different venue and with different setups in order to augment flexibility and usage scenarios. A totally new harp, a Salvi concert harp, aptly named Glissando Orchestral Harp, was added to the original Glissando Concert Harp. Please enjoy some pics stolen during the sessions for Glissando Orchestral Harp. Featuring 4 short videos: Glissando, Harp/Piano modes, Articulations management and Sounds. This is a selection of audio demos for Glissando Harps. Demos were created by Jordan Rudess, Roland Seph Erulo, Felice Tazzini, Nicola Pastori, Jay Asher, Federico Mazzei and Enrico Goldoni and mixed by us (apart from Jordan’s demo which materialized in our email box one morning). Some demos are also presented with the Harp soloed to get an even better idea of its sound and articulations. GOH stands for Orchestral Harp and GCH stands for Concert Harp. Fidbak Audio’s embedded player is one of the few on the market to allow for high quality streaming (native WAV). You can select to stream an mp3 version by clicking or touching on the relative “mp3” button. The very reason we decided to embark in sampling a concert harp in 2012 was to achieve a flexibility unknown in sampled harps. The sound of harps is unmistakably linked to the Glissando technique, where the harpist runs her/his fingers across the strings creating a dreamy and catchy sound unique to the instrument. 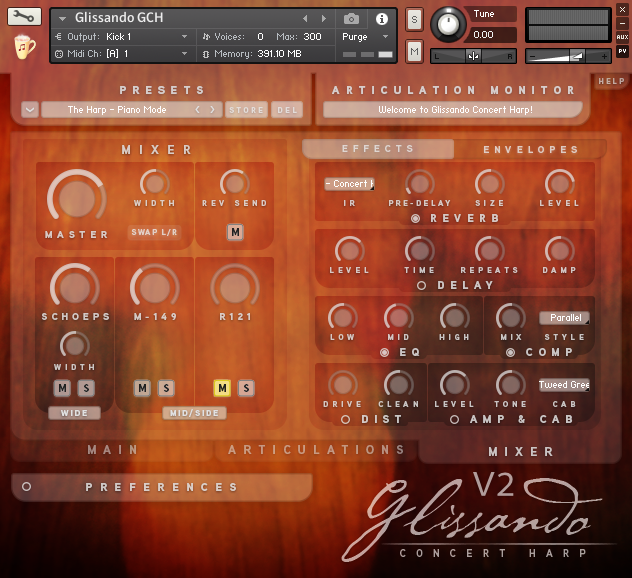 Our Glissando engine lets you play Glissandos at any speed, in any tonal center and setting playable on a real harp. When using the Glissando Mode you're left with only the white keys (as the harp features 7 strings per octave) and change the tuning of each string by switching the positions of the Pedals via MIDI or GUI. We created a selection of the most used tunings in the section on the right to give you a quick way to get the Glissando you want. Turn on Glissando Mode, play a starting note, then play an ending note. The Glissando starts right away. Press D#0 to stop or C#0 to quit Glissando mode. The time difference between the two notes will tell the engine the speed of the Glissando. The relative velocities will be used to create eventual crescendos and decrescendos. Use the ModWheel to change the velocity/intensity of the Glissando in real time. Use the Pitch Bend to slow down or speed up the Glissando in real time. 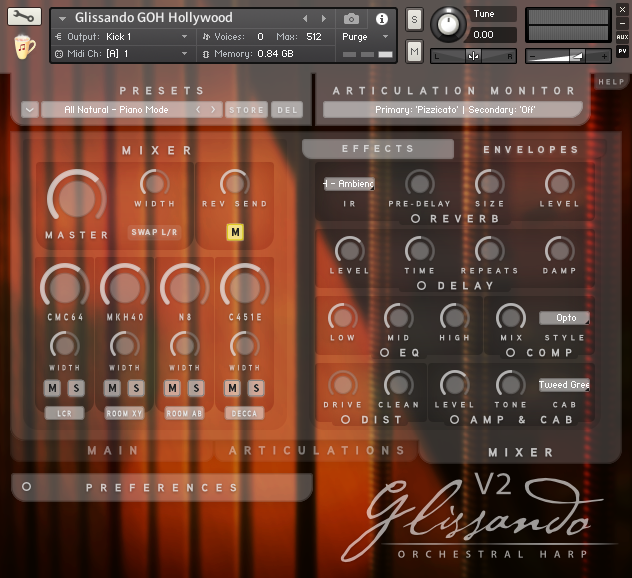 Select one of 7 Glissando Modes via the menu. In both modes, use the Sustain pedal to sustain notes indefinitely like the harp is supposed to do, or release the pedal and play every note in a Staccato fashion with life-like release sample trails. The user interface is thought out to be easy and quick to learn and use while featuring the power-user tools some of us love to tweak when working with deeply sampled instruments. To these 23 Articulations, add the string Resonances, the 2/3 types of release trails (finger nails, tips and Etoufee) and the sound of stopping the strings with the hand which is produced automatically when releasing the Sustain Pedal. The mixer module allows you to balance the mics and apply effects like Delay, EQ, Compression, Distortion and Amp/Cab. The IR Reverb module in our engine currently features 39 unique proprietary impulse responses. These are originated from vintage plates, hardware and coveted real rooms, which, when used with the harp, push the limits of what can be done with this instrument. The Mixer page features a section dedicated to envelopes and filters. Control the Amplitude Envelope with precision using an AHDSR envelope with the addition of the Attack Curve parameter. Choose among 4 filter types - low pass 2 and 4 poles, band pass and high pass 4 poles - with MIDI CC# assignable Cutoff, Resonance and Envelope Modulation. Use an intuitive AHD Envelope to influence the filter cutoff via Env Mod. 26 (GCH) + 50 (GOH) = 76 global mix-ready factory presets ease your way into using this instrument, or create and save your own. For our Concert Harp we selected a warm mid-sized room to record the Camac: we wanted to have a flexible sound, one that fits many different styles and scenarios. All recordings were done using a pair of Schoeps CMC6 (with matched MK4 capsules) in a stereo AB configuration (wide stereo) and a Neumann M149 tube in cardiod mode as the Mid and a Royer R121 as the Side of a MidSide pair. Vovox cables were run direct to a Millennia HV3D-8 preamp and to an Apogee Symphony converter set at 96KHz/24bit. For our Orchestral Harp, instead, we went to one of the best recording live rooms in Europe: Sotto Il Mare Recording Studios near Verona (Italy), a room with a wonderful and lush sound perfect for when you need to position an harp in an orchestral scenario, both as accompanist and as a soloist. There, we set up this wonderful Salvi harp with 8 different sets of microphones which we later combined in five “movie-city-named” nki instruments. An LCR (wide AB + central mono) with Schoeps CMC64 and Soundelux U195, the mono Soundelux U195 by itself, another wide AB with ribbon AEA N22 matched pair. On one side of the harp. On the other side: a tube mic Blumlein setup using a Wunder Audio CM7 pair, an AB with Soyuz SU013. Distant miking setups: a frontal, on axis, XY captured with a Sennheiser MKH40 pair, a really wide AB with ribbon AEA N8 and a Decca trio consisting of three AKG C451E with CK22 omni capsules.